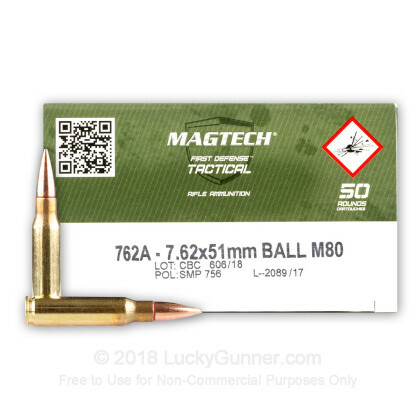 Newly manufactured by Magtech Ammunition, this 7.62x51mm M80 ammo is perfect for your 7.62x51mm or 308 win chambered rifle. This high quality ammo is made to NATO specifications! Note: This ammo is considered magnetic as M80 ball ammo contains some steel in the bullet's jacket. This stuff runs flawless through all my Hk91's,M1A's,bolts,etc. Really good clean quality stuff. I tried 100 rounds through my SAR-8, and had no FTE, FTF, and seemed to shoot cleaner than Herter's steel cased ammo. It grouped fairly well for target shooting, and is a good option. 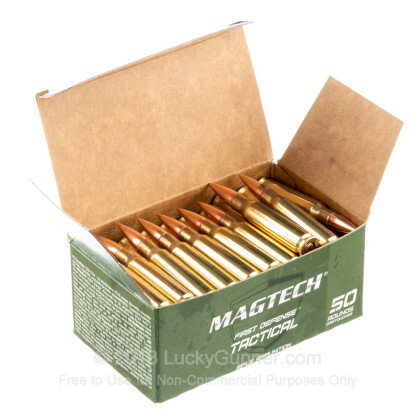 This ammo has bad brass the case swells upon firing and jams in the M1A chamber. It needs to be pounded out with a single piece solid cleaning rod. It also gets jammed in a Remington 700 bolt action. I ordered some of this ammo, the shippment was fast and the ammo shoots about a half inch group at a hundred yards. No problems. It also reloads pretty good. Good ammo to train with. 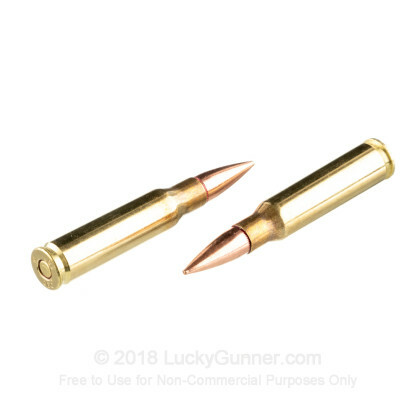 Plan on reloading the brass when these are gone. 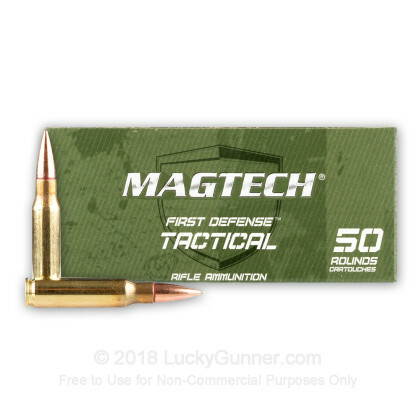 I would order this ammo again as it functioned well in my M1A with zero issues. Groups were acceptable but I was not particularly concerned with this since was looking for reasonably priced ammo to stock up on for practice sessions. Overall a good experience with LG. 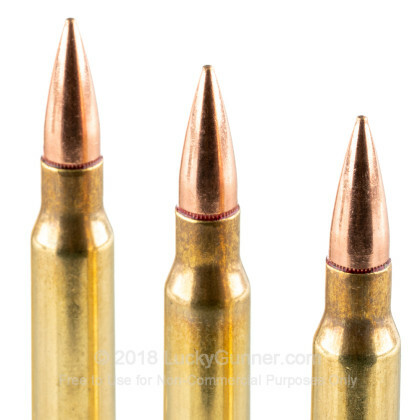 I can't speak to those of you using faster-firing rifles, but I bought a bunch of these to sight in my new single shot Ruger No.1 and to have some fun firing and getting used to the rifle. What's to jam in a single shot? But still, they certainly loaded as they're supposed, to, fired when they were supposed to and ejected cleanly. I'd never used Brazilian ammo before so I was a little skeptical, though I trusted Lucky Gunner not to sell me crap. I don't know how they'd serve as a hunting load - I paid up for a box of Hornady 150 gr. for that, but these grouped really well at 100 yds) I didn't measure because I didn't really care, but a nice tight fit on the target. I did have to adjust the sights about an inch up and an inch right when I switched to the Hornady load - that much of a difference surprised me but I'm more of a hunter than a knowledgable shooter, so what do I know? Didn't seem like a flaw, just a lesson in cartridge loads for this neophyte. 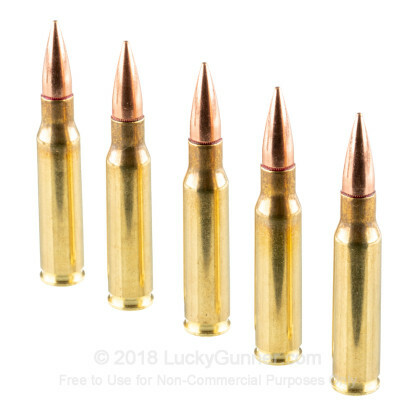 The cardboard box they shipped in didn't survive transit but at half the price of a Hornady, I can pour fifty rounds of these in one of my parka's pocket and all the saved money in another. Good deal. A: The 7.62x51 is dimensionally identical to the 308 round, though the pressures are lower than the 308. This round will safely fire in your Remington 700. This practice is similar to shooting .223 ammo in a 5.56 NATO rifle.